The sheer scale of the disaster struck Roland Dewhurst as he was congratulating himself on the quality of his work. He had switched off the lawnmower, lifted himself from the soft, leather seat and was staring in admiration at the lushness of the lawn. He pulled the packet of cigarettes from his pocket, checked that no one was watching and lit up. He inhaled the smoke and relaxed as the nicotine kicked in. He took a few more drags, stubbed the end of the cigarette on the heel of his shoe and placed it back in the packet. He turned, detached the cuttings box and walked over to the compost heap. He was watching the cuttings tumble down before him when he spotted the tail and the two tiny legs protruding from the grass. That was when his heart stopped and the artery on the side of his neck began to throb as if it was about to explode. He leaned forward and prodded it gently. He placed his fingers around the tail and drew the small creature towards him. It emerged almost totally intact save for one thing that was clearly missing. It’s head. Oh my God, he thought. Not Timmy, please not Timmy. For some inexplicable reason, he prodded it again and again checking if it was really dead. He leaned forward, scrabbled in the compost and eventually pulled out the small head. He stared at it for a while and was surprised to find that there had been scarcely any damage to it at all. That was apart from the single cut around its tiny neck, which was covered in a thin layer of congealed blood. Its eyes were closed as if it was fast asleep and its large, elongated ears lay limp against its skull. He pulled it towards the torso and pushed the two parts together, making the creature whole again. He smiled nervously. That’s when he heard the car pull into the drive. That’s when he heard the tell tale sound of the horn heralding the arrival of his wife, Gloria and their young daughter, Juliette. ‘Rol….and!’ echoed through the house shattering his moment of tranquility and despair. He froze to the spot. Suddenly, there she was, her voice increasing in intensity as she strode towards him, her heels digging into the lush green turf. His hands remained outstretched with the two parts of the hamster lying there like some sacrificial offering. 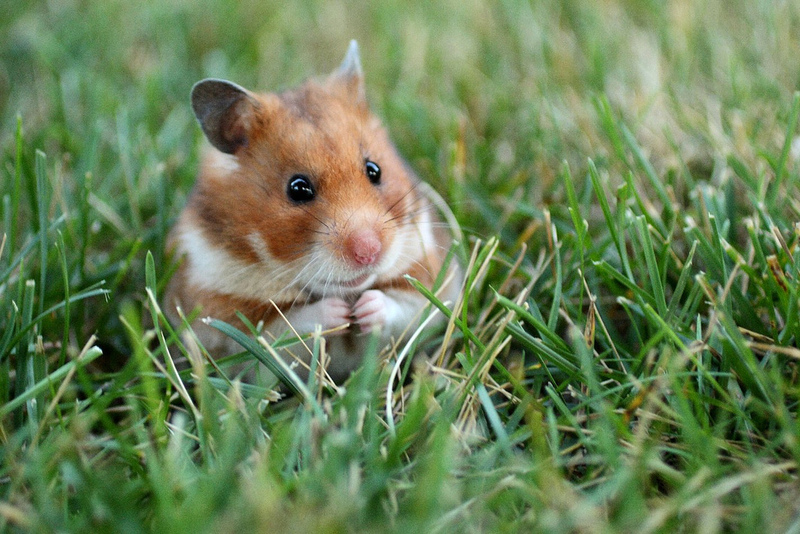 Roland reacted immediately and placed both hands inside his pockets, pushing the hamster down as far as he could. Roland removed his hands and held them out in front of her like some naughty child. ‘Disgusting!’ she bellowed, ‘You’re like a schoolboy hiding behind the toilets. On your head be it when you keel over.’ She turned and stormed off. Roland took no notice. He had more important things on his mind. How on earth was he going to explain the death of Timmy to his daughter? She adored the creature. She would be devastated. He knew in an instant that he had only one option. He would have to replace it and replace it fast. He dashed round to the side of the house, unlocked the bicycle and pushed it past the kitchen window. ‘Just off to the village,‘ he shouted as he climbed on to the saddle and pedalled for all his worth down the hill. He parked the bike outside the pet shop and strolled in. It was a small, cluttered shop with baskets stacked in the window filled with puppies, cats and rabbits. Behind the wooden counter stood a tall thin, angular man who could have been mistaken for a stick insect. ‘Can I be of service?’ he mumbled. ‘Bar-low,’ said the man bending his head forward and staring at the two parts of the creature. He placed his long fingers on the head of the hamster and stroked its snout. ‘Accidents do happen. I presume it was an accident,’ he said staring at Roland with an air of disbelief. Barlow turned, disappeared into the back of the shop and returned with a cage, containing a small hamster. Roland could scarcely contain his excitement. It was exactly the same colour as Timmy and was almost identical in every way. He wanted to hug him but thought better of it. Roland thought he could detect a slight twitch in the upper lip of Barlow but disregarded it. He pulled out the £50 note and passed it across the counter and took the small cage. He placed it in his rucksack, smiled and left. Barlow pulled the remnants of Timmy towards him, tipped them into the palm of his hand and retired to the back of the shop, dropping the remains into his bin. Roland was ecstatic. He stopped outside the shop, pulled out a cigarette and lit it. He didn’t notice the large figure standing next to him outside the bank next door. One minute he was inhaling the smoke and relaxing, the next he was flung to the ground as he was flattened by a group of men with faces covered in black nylons. As he fell, the rucksack hurtled forward. Unfortunately, it hit the road at exactly the same time as the men climbed into the getaway car and sped away. One minute, Roland’s problems had been solved, the next they lay crushed before his eyes. Roland stood up and stared at the flattened rucksack. He composed himself, turned and returned to the pet shop. ‘I’ll give you anything, anything,’ screamed Roland, his face turning bright red. ‘A hundred pounds!’ snapped Roland. Barlow stared at him for a moment, his upper lip twitching. ‘Yes,’ said Roland, pulling out his wallet and counting out the fifties. Barlow scooped up the money, stuffed it in his pocket and moved to the back of the shop. He returned with another cage with a hamster inside. Roland left, attached the cage to the handlebars and started the journey back up the hill. He pedalled furiously, pushing his body as hard as he could to get back before Juliette discovered what had happened. He struggled up the hills, sweat pouring from his face and was in sight of the house when he heard the barking. He turned as the huge dog tore out of the neighbour’s driveway. It fixed its eyes on the hamster and pursued him up the road, leaping at the cage. He pedalled and pedalled, his legs going faster and faster until the very last bend when it made one final leap. The bike skidded, swerved sideways and tumbled down the embankment. He rolled and rolled, landing with a crash as the cage flew through the air. Roland looked on in horror as the small creature was flung outwards, somersaulted and hurtled headlong towards the river. At the very last moment, he summoned all his strength and made one despairing leap. His body arched upwards, his fingers groping for the tiny shape. In an instant, he clasped it to him before crashing headlong into the freezing cold water. The tiny creature stared at him as he pulled himself out and staggered up the hill to the back of the house. He opened the french windows, tip toed in and checked that his wife and daughter were in the kitchen. He moved silently up the stairs, entered his daughter’s bedroom and placed the little creature in the cage. He returned to his own bedroom, immersed himself in the shower and congratulated himself. He changed, descended the stairs and smiled as his wife looked at him suspiciously. ‘I didn’t see you come back,’ she barked. He was just pouring himself a celebratory drink when he heard the scream. A scream that shattered the silence and reverberated around the house. ‘Oh my God, Juliette are you alright?’ said Gloria. She flew up the stairs followed by Roland. The bedroom door was wide open and there on the bed was Juliette with the small hamster in her hands. She was sobbing. ‘What is it my sweet?’ said Gloria, putting her arms around her. ‘What do you mean?’ said Gloria, stroking the hamster’s neck. ‘Tell us what?’ said Gloria. ‘You dropped something on him?’ said Gloria. Gloria turned as Roland backed slowly out of the room.